I know this stuff is Extremely Wonky, so let’s start with this Bottom Line: America Fast Forward is a good way to reduce the cost of building big transit projects and stretch Measure R sales tax dollars. Less cost always makes it easier to build transit. Always. Metro just needs Congress to fully adopt America Fast Forward. So that’s the bottom line. Now a few more details: America Fast Forward is a program that Metro is pushing to greatly expand federal funding of new transit projects. Congress adopted part of AFF in 2012 when it greatly expanded a federal loan program that helps agencies such as Metro secure good interest rates on loans needed to build projects. This was a very positive step forward and Metro is using TIFIA loans to help build the Crenshaw/LAX Line, the Purple Line Extension’s first section and the Regional Connector. 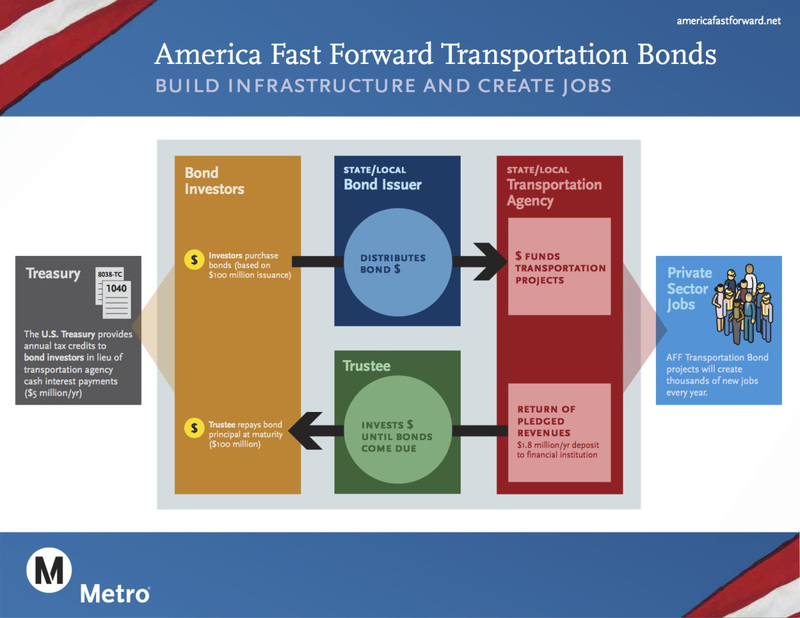 With Congress set to consider a multi-year federal spending bill on transportation this spring, Metro is hoping to persuade lawmakers to adopt the other half of AFF, a bond program that would basically subsidize the interest that transit agencies normally have to pay when they sell bonds. Again, the bottom line: bonds with no interest payments = less expensive transit projects! This week, as a result of the leadership of the Los Angeles Area Chamber of Commerce, 148 Chambers of Commerce from 48 States co-authored a letter to Members of Congress in support of our agency’s America Fast Forward (AFF) Transportation Bonds initiative. Los Angeles Area Chamber of Commerce President and CEO Gary Toebben led the campaign to garner support for our agency’s AFF Transportation Bonds proposal from a diverse group of Chambers of Commerce, from Alabama to Wisconsin, Arizona to West Virginia. The LA Area Chamber of Commerce is currently seeking additional support from Chambers of Commerce in New Hampshire and Wyoming – which would give us backing from business groups in all 50 States. To view a copy of the Chambers of Commerce correspondence to Members of Congress in support of AFF Transportation Bonds, please click here. AFF Transportation Bonds are a tax policy initiative designed to stimulate greater investment in the transportation sector. They provide a substantial subsidy to the issuer by having the federal government pay all or most of the annual “interest” due on the bonds in the form of an annual tax credit against the investor’s federal tax liability. On a long-term bond, the interest component of debt service represents 65 percent or more of the financial cost of borrowing. For tax purposes, the annual credit is treated by the bondholder as taxable interest income. AFF Transportation Bonds would be structured as a sixth class of “qualified tax credit bonds” (QTCBs) under section 54A of the Internal Revenue Code. Over the last decade, Congress has authorized over $35 billion of QTCBs to assist sectors such as public education, clean renewable energy generation and energy and forestry conservation. AFF Transportation Bonds would represent the first application of QTCBs to the transportation sector. AFF Transportation Bonds, if enacted, would differ from the other QTCBs in several respects. The maximum maturity could be as long as 35 years compared to a maximum maturity for other QTCBs currently of only 25 years. This longer maturity is necessary due to the long-lived nature of transportation projects which tend to be highly capital-intensive. The Treasury would establish a separate “interest” index for the tax credit rate on AFF Transportation Bonds, reflecting their longer maturity. Lastly, the list of taxes that the credit could be offset against would be expanded to include federal withholding tax on wages and benefits retained by employers and pension plan administrators. This is necessary because of the much larger scale of transportation projects, and would significantly broaden the market for the tax credit bonds to include pension funds. AFF Transportation Bonds would be a $45 billion program, with eligible projects being surface transportation facilities eligible under title 23 or chapter 53 of title 49: highways, bridges and tunnels; transit and intercity passenger bus or rail; and intermodal freight transfer facilities and private freight facilities conferring a public benefit. AFF Transportation Bonds would, if enacted into law, enable project sponsors to undertake substantially greater investments within a defined revenue stream for debt service payments than other borrowing approaches, such as tax-exempt bonds or the TIFIA federal credit program.